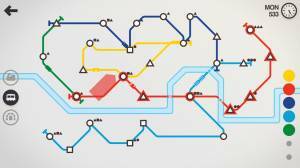 Mini Metro is a free-to-play puzzle game that involves subway planning. Each of the different levels is meant to evoke a subway map and are designed around a specific city's geography and river placement. The object of the game is to connect the stations that pop up randomly around the map so that you create connections that enables commuters to reach their destinations in a reasonable amount of time. More and more passengers will show up with different transit demands and the game will have you scrambling to keep up. The more passengers that move through your system, the higher your score. If any station becomes too crowded your system fails and it's game over. No discussions open for Mini Metro at the moment.